This review is about item#7502416. The conical spring is easy to use because it is easy to balance the fixed point and the action point. The moment the electromagnetic lock opens, the door is pushed a little bit, and then the little movement taken over by the actuator makes the whole movement sure, thanks to this spring. It is used as a return spring for the rear brake master. If you use a vehicle without a return spring, such as external back step, you can use it by selecting the right size. This review is about item#7502443. To fix the resistance of the car. Resistance is necessary for erasing the turn signal by error cancellation. So how about fixing the resistance? A box-shaped frame passes through our V40, and the front is open. Resistance can be put in it, but it can not be screwed, so to friction fix it. 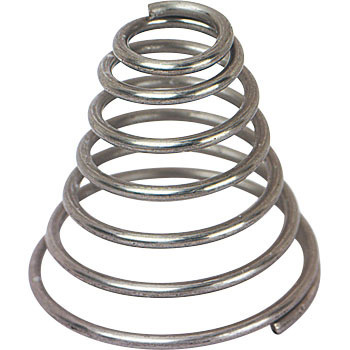 Because ordinary springs are sized when compressed, I thought of this conical spring. Fix the spring of the gauge with a glue gun on the square resistance and press it. It seems that various uses can be done. This review is about item#7502452. There was no product problem, there was not. This review is about item#7502276. This review is about item#07502242. This time, I searched based on the free length (25 mm), so the small inside diameter was slightly small. I used it after processing a little, but there was no problem. It was kind of rich and saved. This time it was a small and light article, so I thought if I could think of packing a bit more, I got cheaper. This review is about item#07502355.